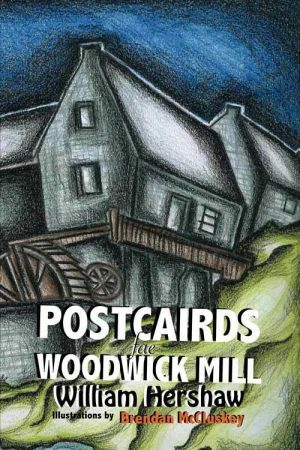 Postcairds fae Woodwick Mill is the latest collection from poet, teacher, musician and songwriter, William Hershaw. Written in the Lallans Scots of Rabbie Burns, the collection comes with a CD of poems, beautifully recited by Hershaw, some with musical accompaniment. The CD gives a clue to the fertile ground from which these offerings spring; many of the poems are firmly rooted in the traditions of folk song and folklore. They revolve around the turn of the seasons, the wind and weather, the birds and beasts of field, sky, water. They’re peppered with recognisable characters: the ‘puir tink’, the haughty mistress, the raging father, the wayward daughter, the drunken farmer stumbling home from market. As can perhaps be gleaned from this description, this isn’t a collection for those seeking the avant-garde, the cutting-edge of today’s poetics. There’s nothing new here per se but one gets the impression that Hershaw is not trying to ‘make it new’. There’s no attempt to break through linguistic boundaries or experiment with unusual modes of poetic expression (unless, perhaps, in the quietly witty lament for ‘Schir Mungo Lokert o the Le’, a blank page with the footnote ‘Schir Mungo Lokert is one of the poets listed by William Dunbar in the Danse Macabre Lament for the Makeris written around 1505. Nothing of his work has survived for posterity.’). Hershaw’s collection is more a celebration of the poetic forms and constraints that come out of the great Scots oral tradition: the simple rhyme schemes, the long narrative of ballads and folktales, the sonnet, the ditty, the prayer. in the month o the deid. Fireworks ower nae man’s land. Ruid for a sign that says: Shelter. … makes them perfect for primary schools. Indeed, many of the poems have the rhythm and rhyme that children delight in, the long narrative that keeps them engaged and illustrations (by Brendan McCluskey) that have a certain child-like appeal. In addition, there’s Hershaw’s gentle tongue-in-cheek humour. In ‘Wee Fergie’ (an ode to Robert Fergusson), Burns is described as a ‘Lallans Elvis’ while Satan in ‘Onding’ is ‘Crombie coated’. Burns’ ‘To a Mouse’ is also brought to mind in a later ditty ‘Mousie’. While the latter might have the great bard birling in his grave with its talk of zombie mice turning up again and again in the mousetrap each morning, I suspect bairns might prefer it to the original. Add to this the many cross-curricular possibilities—Hershaw’s curious pen scribbles around science, politics, philosophy, history—and the intertextual references to Sunset Song, Garioch’s ‘At Robert Fergusson’s Grave’ and The Clash’s ‘London Calling’, and the poems become stepping stones to many different areas of study. A leid for aa mankind, a leid caaed love. Postcairds Fae Woodwick Mill: Orkney Poems in Scots by William Hershaw is published by Grace Note Publications, 2017. Alison Flett is a poet, publisher, film and theatre critic. Her poetry collection Whit Lassyz Ur Inty was shortlisted for the Saltire Book of the Year Award. She now lives in Australia and recently received an ArtsSA grant to complete a new collection of poetry. She is poetry editor of Transnational Literature.